If you want to win, you need to know how to throw darts with precision. You can find dart boards in thousands of home bars and game rooms, so you should be ready for a game. I used to stink at darts. I got tired of always having to buy the beer after every game. So I became determined to find as many tips as I could to getting better. I may not be competing in any national dart tournaments, but with just a little knowledge, I can now hold my own in any darts match. These are what I have found to be most useful dart throwing techniques I have found over the years. 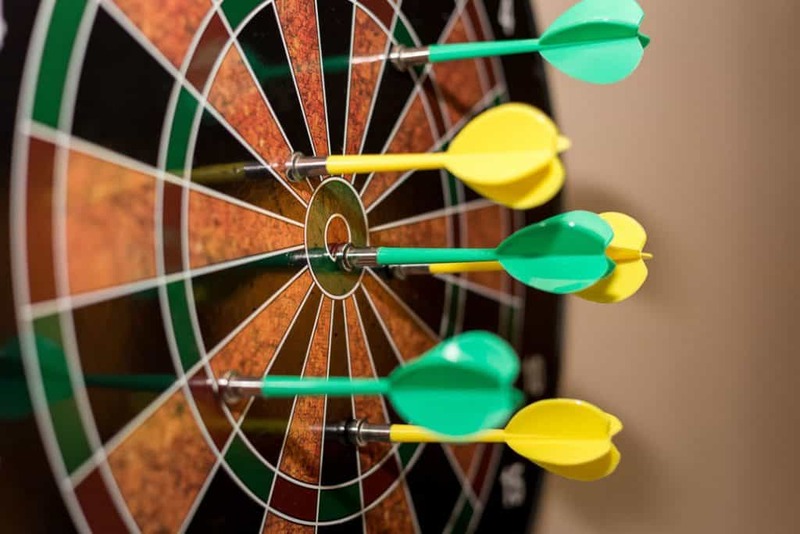 Follow these steps and your dart game will improve significantly. 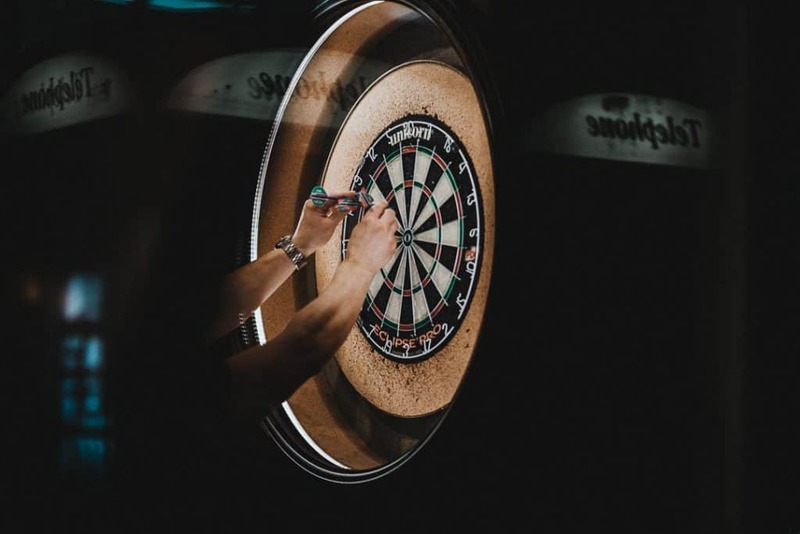 And if you are looking for a quality dart board, here’s a list of professional quality dartboards for your home. Getting your feet into the right position is huge. It allows you to aim properly, freely swing your arm in an efficient way, and prevents you from swaying and losing consistency. You’ll see a lot about consistency in the following tips. When you are learning how to throw darts with precision, being consistent is as important as being good. If you know that you always miss three inches to the right when you aim, all you have to do is aim three inches left of your target and you can hit it. If you are inconsistent, then there’s no adjustments you can make and it just becomes a game of luck rather than skill. To win a game of darts, you need to know how to throw darts with precision. The most important part of foot position is getting your dominant foot forward. Start with your feet about hip width apart. Then move your dominant foot up to the throwing line. Many players prefer to have it right up against the line so that they know they are always a consistent distance from the board. I would suggest keeping your foot just slightly behind the line because any movement you make during the throwing process might move your feet a little. Now feet moving is something to be avoided because it prevents consistency, but missing a bulls-eye from slight shuffling and having your shot disqualified because you touched the line are very different. you want to give yourself enough space so that you never have to worry about touching the line. Your back foot should be remain about hip width apart from the front foot. Keep it behind the lead foot using the throwing direction as your guide. This will put you into a body position with the shoulder from the throwing arm pointing at the board and your chest facing perpendicular to the board. This allows you to line up the board, the dart, your arm angle, and your eyes for consistent aiming and throwing. You should keep most of your weight on your front foot. A good weight distribution is about 60/40 favoring the front foot. Too much forward and you will be off balance. If you are off balance, you’ll never be able to hit the same spot twice. Remember consistency is important. It is ok to lean forward a little. Many players do that. Some players think that leaning forward gives them an advantage. This might be true up to a certain point. First, you need to be leaning consistently. If you lean a different amount each time then you’ll be all over the place. Second, leaning forward too much will put too much weight on the front foot and cause you to become unbalanced. Leaning forward too much will put too much weight on the front foot and cause you to become unbalanced. 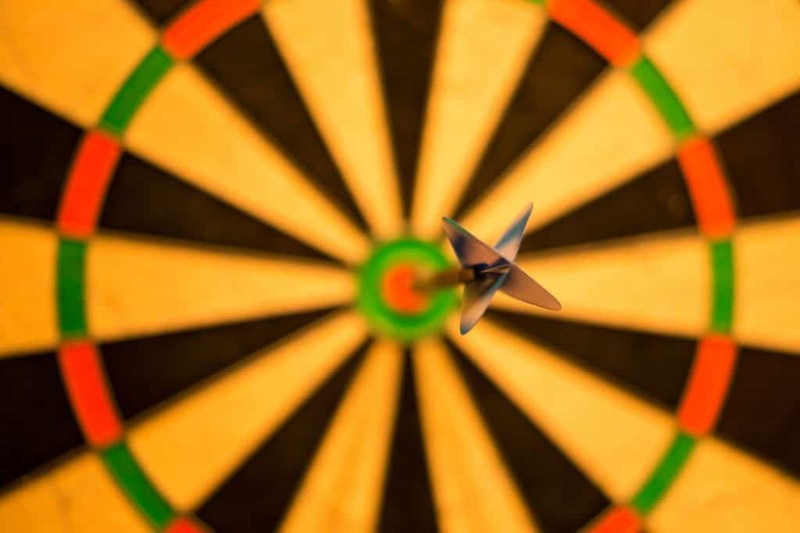 The result is that you will not be stable and the slight body movements that result will ensure that even with perfect aim and throwing, you’ll never hit the same place twice with the dart. You also should consider that an evening of playing darts can become uncomfortable or even painful if you spend the whole night leaning over. My suggestion is to favor a balanced and comfortable stance over a few more inches closer to the dart board. There is no single “correct” grip for a dart. There are, however, some guidelines that can help you learn how to hold a dart in a way that makes it easier to score. You can do this by finding the point where the dart will balance on your finger and not fall forward or back. Start your grip by placing your thumb just slightly behind the center of gravity. Gripping at the center of gravity will help the dart stay balanced during the throw and will increase accuracy. This gives you a good starting point. Start with a three or four finger grip. It might seem more natural to grip it with only two fingers, but that generally does not give you enough stability to keep a steady aim while throwing. Having two fingers on one side and the thumb on the other prevents the dart from twisting while throwing it. Also, one finger is definitely not ideal. Just like any sport, it is important not to have too tight a grip. Of course you also don’t want to grip the dart so lightly that it falls out of your hand. You want the dart resting in your fingers rather than being squeezed. Think of how you would hold a potato chip without breaking it. Keep the other one or two fingers open that aren’t gripping the dart. Aiming techniques for darts is unique to every player and you should experiment to see what works for you, but I’ll give some baselines here to get you started. Hold the dart up and put your eyes, the dart, and the target all in line. This may seem simple but it can be more difficult than you think to dial in your aiming and does require some practice. Once you can throw the dart consistently, you may see that where you aim is not necessarily where the dart ends up. Ultimately, your dart throwing technique and ability to release the dart consistently comes with practice. The good news is that if you have ever played any sport that involves throwing something then you have most of the skill necessary to be good at darts. Humans have been throwing things for their entire existence, to hunt food, to defend themselves, and for recreation. So trust your natural feel for throwing the dart. There are a few tips that can help you refine that natural feel and help make you more consistent. Just about every part of your body except your arm should be stationary during the throw. Your arm acts as a lever or whip of sorts. If you ever watched a medieval or fantasy war movie where they used a catapult then you have seen this motion in action. The shoulder stays stationary to act as the base for that lever. The elbow remains still while aiming and bringing the upper arm back. During the forward motion you want to be as loose as possible without dropping the dart. You don’t need to keep the elbow still anymore as it will naturally move up as you throw. This is one area where a lot of beginners make a mistake. They try to keep the elbow stationary to aim better. However, doing that restricts your natural arm motion and makes for an awkward throw with much less velocity. This will actually have a negative affect on precision. The dart should travel on an arc. You may feel like you are throwing it straight at the board but unless you throw it as hard as you can (which is no good for accuracy) it will certianly travel on an arc. So it is important to know that, understand that, and expect that. Here is where your natural feel for throwing thing comes into play. With just minimal practice, you should be able to get a feel for that arc and where it will end up. If you have followed all the tips up to now, you should have a relatively consistent throw. Now it is just a matter of refining your throw so that you can repeat it every time, seeing where you are missing, and make adjustments accordingly. But don’t adjust too much. Especially if you are just getting started, if your margin for error is more than a few inches then you should work on refining your throw rather than adjusting your aim. Making big adjustments at that point will just prevent you from improving. Once you can throw the dart within a 3-4 inch circle relatively consistently, you can start to see if you miss in the same direction regularly. Then you can try adjusting your aim to compensate. If you are missing by only an inch or two then don’t adjust your aim. Except for the very best pros, that kind of miss is most likely related to variations in throwing rather than aiming. If you are that close then stay consistent and keep repeating the same action. Your dart throwing strategy should depend on your skill level. Though there are many variations of dart games, the most popular is 501 which requires hitting high numbers and hitting them consistently. So most of this strategy is focused on scoring well in a 501 game. 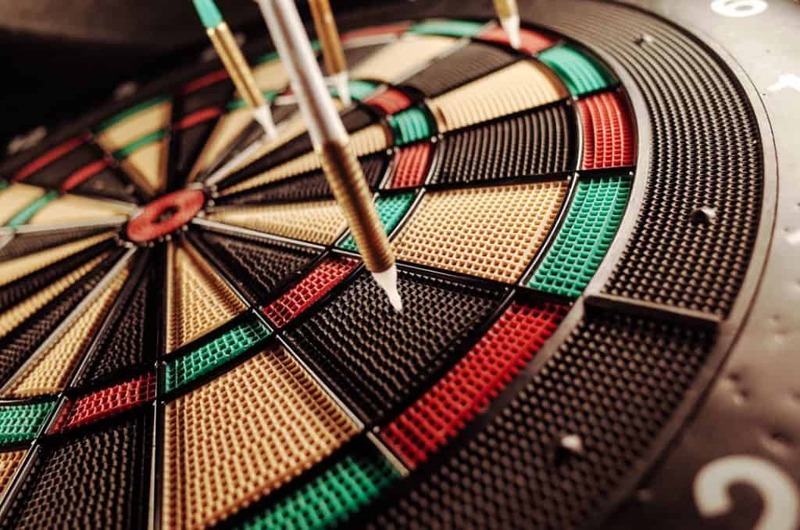 A statistician at Stanford University, Ryan Tibshirani, conducted a study on where a less skilled player should be aiming on a dart board in order to maximize their scoring potential. He concluded that the only players that should be aiming for the treble 20 are those that can be accurate to within 5mm. Players that are accurate to within 25mm should be aiming for the treble 19. Less accurate players would do much better to aim for the bulls-eye with the optimal aiming point to the lower left of the bulls-eye. He determined that a poor player aiming at the bulls-eye would have a higher average than if they aimed for the treble 20. This is mostly due to the likelihood of missing the target and hitting the surrounding spaces. If you are aiming for the lower left of the bulls-eye then your misses will be to higher point values and the occasional bulls-eye. You can read the entire study here. There, Tibshirani explains how he measured a players accuracy and how he came to these conclusions. As your skill level improves, you can start to focus on throwing darts with precision and aiming at more discrete targets. As your darts improve you should concentrate on 20’s or 19’s. Even 2 out of 3 darts will give a score in the 40’s which is better than 3 darts in the 14-11 or 15-10 sections. If you already hit your target once or twice, keep in mind that the darts that are there may block the next dart from sticking. So you may need to shift to one side or the other and angle back toward the board to give yourself the most amount of real estate on the board to aim for. This takes practice because you are already in a groove from hitting one or two in the same spot and you need to reset yourself. For beginners, don’t bother adjusting, just keep throwing. If you want to be good at darts you need to practice. 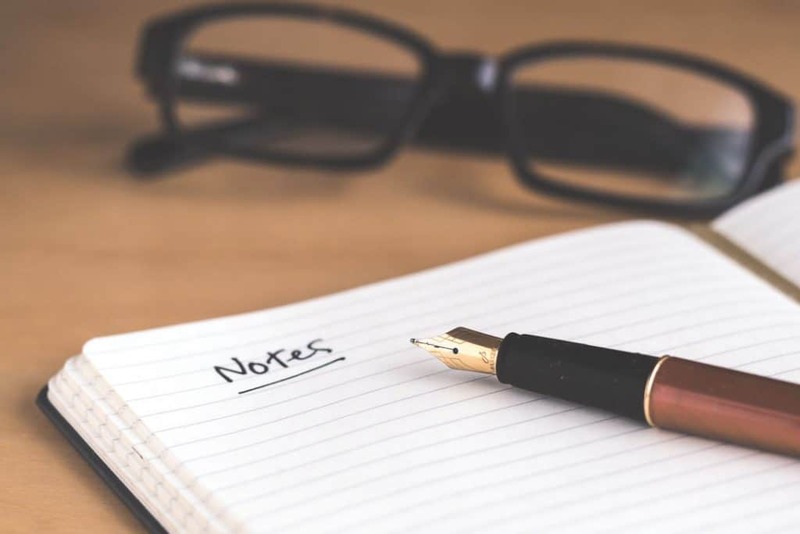 Here are a few ways you can make your practice time productive. One of the most useful ways to practice is to try and create pressure on yourself similar to that which you’ll face when actually competing against another player. That is not easy to do. An effective way of generating pressure when practicing by yourself is by creating individual games. Try this one. If you know your average 3 dart score then you have the perfect competitor. Let’s say you average 40 points for a three dart turn. Give yourself a point for every time you beat 40 points on a turn. Give your competitor a point for every time you hit 40 or less points. First to 10 points wins. This will force you to consistently increase your average score and serves as a good way to track how you are progressing. Speaking of tracking…you need to be recording your scores as much as possible. The only way you know if a new technique or adjustment is working is if you are tracking your average points total. There are two main ways to do this. Tracking how many turns it takes you to hit 501 (assuming that is the game you mostly compete in) and tracking your average 3 dart point total. Both are important. For less advanced players, it is probably more important to track your three point total at first because that is what you should be focusing on to start. Also, since you need to hit 501 exactly, that measurement may be skewed dramatically for newer players. But as you improve, you’ll want to focus more on closing out that game faster. Finally, you want to do as much as possible to document what you are doing when you are having a good day. Every player in every sports has those days when everything just clicks. Some players are superstitious and don’t want to do anything to disrupt that. But it won’t last forever. So take some time and think about the feeling you are having and what you are doing differently. That may just give you the information you need to recreate that feeling more often.